CHICAGO — When Graham Skinner was general manager of laundry services at Mission Hospital in Asheville, N.C., he was always on the search for the most effective wash formulas. In order to create those formulas to produce the best outcomes, Skinner worked side-by-side with his chemicals suppliers—and he looked for specific qualities in those suppliers. Skinner also looked for suppliers who provided documentation of the process for administrative and compliance reasons. Today, Skinner is on the chemicals side of the industry as a sales manager for U.N.X. Inc. And he knows what laundry and linen service providers are looking for when it comes to creating wash formulas: quality, service and value. Kevin Minissian, president and CEO of Norchem Corp., says that while there may be something that can be called the “right” wash formula, that does not necessarily mean there is one right formula. “For example, the right formulas for one facility may not or will not be the best fit for another,” he says. David Barbe, director of engineering for U.N.X., agrees, and says there are multiple methods to clean goods. Tinker adds that more specific considerations have to be taken into account, such as type of washing equipment, productivity requirements, and energy and water conservation goals or limits. Other operating conditions, such as the quality of the water and any restrictions on chemistry created by wastewater regulations, also must be considered when a laundry seeks to create the most effective wash formulas for the goods it processes. 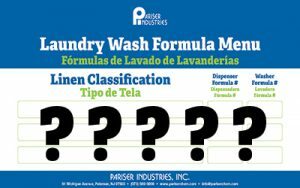 When it comes to programming wash formulas, the formulator’s interpretation of the established laundry industry pie chart is key, says Scott Pariser, president of Pariser Industries. The “pie” is initially divided into the four equal components of time, temperature, mechanical action and chemistry. For instance, if a plant can’t provide sustained hot water at required minimums, wash time or mechanical action (through reduced loading weights or water level variation) or chemical dosages, and maybe all three, will need to be enhanced proportionately. Barbe says a good formula is usually the result of starting with reasonable guidelines, titrating the baths for concentration, and then adjusting time, temperature and chemicals to achieve good results. In the end, both the laundry and the chemicals supplier have to consider their customers. Pariser says wash formula construction requires a delicate and thoughtful consideration of the individual laundry and its production requirements, along with local water-in and water-out restrictions, in order to provide the best approach to providing clean, hygienic linens in a cost-effective manner. Two major factors for laundry operators and chemicals suppliers to consider when creating wash formulas are the types of fabrics being processed and the types of soils being removed. For the type of fabric, Barbe simply recommends reading the label on the goods to be processed. Then, laundry personnel need to determine what type of soil it is trying to remove. Once the fabric and soil classifications have been determined, chemistry can be selected. “It is also important to note that part of what makes a formula particularly right is having top-quality chemistry and the understanding of how that chemistry can adjust to combat any conditions that may affect the wash process,” says Minissian. Besides the chemistry, temperature, water levels, time and all other factors must be appropriate for the bath and type of goods being washed. In the washing operation, usually the pH is on the high end of the alkaline scale, 11.5-12.5, because many soils are acidic in nature and alkalis can react and neutralize or break down these soils so they can be more easily suspended or emulsified by the detergents in the wash liquor, Tinker says. Also, before the wash formula ends, the fabric has to be at a neutral pH, Minissian says. The fabric needs to be well-rinsed and neutralized to be safe for use—the acidity can result in skin irritations for the end-user. “Sometimes the inactive alkalinity of the city water can cause a high pH, so it’s imperative to neutralize that, not only to protect for human use, but also protect the fabric from chemical damage,” Minissian says. Barbe agrees that the pH of a bath is highly important. The pH levels need to be within the proper range. Alkalinity levels required for a successful washing will need to be determined, says Scott Pariser, president of Pariser Industries. Water quality plays a large role in formula construction, he adds. “Use of water conditioners, location of steam injection (if necessary), formula length and water volumes may all be affected by water hardness, and the aforementioned contaminants found in the inbound water supply,” Pariser says.